The City Council Comparinator site is now embeddable for your website, blog, etc. pick which proposal you’re comparing with (Districting Commission or Unity Plan). Then click “Link” in the upper right and you’ll see the embed code as well as the basic linking code. We also added a feature: if you turn off the popup window before clicking “Link”, it’ll add a “popup=false” property to the URL, so the person viewing the link (or the starting image for your embedded map) won’t have the popup in the way but the district will still be highlighted. Our Center for Urban Research (CUR) at the CUNY Graduate Center has launched an interactive map today to visualize proposed New York City Council districts compared with existing ones along with the demographic characteristics and patterns within the districts. The Center hopes the map will help involve people in the NYC districting process simply by showing them how proposed or newly drawn lines looked in relation to their homes or workplaces. Our map is not for drawing districts; others such as the NYC Districting Commission are providing that service. But CUR’s comparison maps are designed to be be engaging enough to visualize the impact of redistricting for everyone from local citizens to redistricting professionals, hopefully inspiring people to participate more actively in the process. CUR’s map was designed and is being maintained independently from the NYC Districting Commission’s website. However, we hope that people who use CUR’s maps will then access the Districting Commission’s website for drawing maps online. Enter your address to find out what district currently represents you, and which proposed district you’d live in. If you’re using the “Side-by-Side” view, the current districts are displayed on the left, and the proposed districts on the right. If you’re using the “Overlay” view, you can move the transparency slider to the right to display proposed districts, or to the left to fade back to current districts. Click anywhere on the map to highlight the current and proposed districts. When you enter an address or click on the map, an info window pops up listing the current and proposed districts. You can click the link for the current district to go to that Councilmember’s website. Click the “Link” in the upper right of the page to get a direct link to the area of the map you’re viewing. (This one zooms in on City Council District 8 in Manhattan.) You can share this on Twitter or Facebook, email it to friends and colleagues, or blog about it and include the link. The mapping application was developed by the Center for Urban Research. David Burgoon, CUR’s application architect, constructed and designed the site, with data analysis support and overall conception from CUR’s Mapping Service director Steven Romalewski. The application relies on geographic data hosting by cartoDB, open source mapping frameworks and services including OpenLayers and Bing maps, and ESRI’s ArcGIS software for cartography and data analysis. 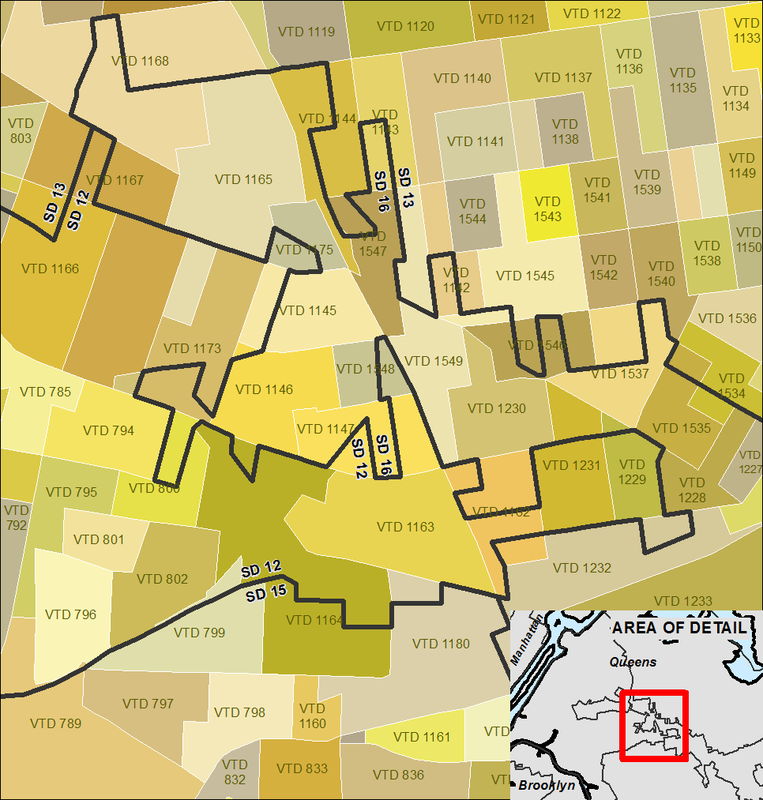 Current City Council district boundaries and proposed maps from the NYC Districting Commission are based on block assignment lists provided at the Districting Commission’s website. Other proposed maps such as the Unity Map are provided by the advocacy organizations who developed those proposals. Just three months after the US District Court approved the redistricted Congressional districts for New York, the state is holding primary elections for Republican and Democratic candidates for Congress and US Senate. Among other things, our new map displays the “citizen voting age population” (CVAP) estimates for each district as well as overall population counts. When you visit the map, move your mouse over each district to display total population counts by race/ethnicity along with “citizen voting age population” (CVAP) estimates. We also have a brief analysis of CVAP estimates compared with total population for each district. In many Congressional districts, especially in New York City, news reports have noted the changing demographics, partly due to population shifts but also due to new boundaries that are the result of redistricting. Districts that may once have had a predominantly Black population, for example, may now have a more mixed population. But overall race and ethnicity population counts only tell part of the story. Population data from the decennial 2010 Census include all residents — citizens as well as recent immigrants who may not yet be citizens, and people who are of voting age (18 or older) as well as children. In some cases, the eligible voting population has a much different racial and ethnic profile than the overall population. Now that data on an individual basis is available from the 1940 Census, our Center for Urban Research at the CUNY Graduate Center has launched Welcome to 1940s New York. The website is based on a 1943 “NYC Market Analysis” rich in local maps, photos, data, and narrative, providing a rare glimpse into life in New York City during that time. We’re making this available both as context for the 1940 Census information, and for researchers and others generally interested in learning about New York in the ’40s. The New York Times has also published an article about the project, highlighting some then-and-now photos and demographic statistics of selected neighborhoods across the city. My post below provides some background about how we came to develop the website. It also highlights some of the more intriguing things you’ll find there. In 1997 the New York Bound bookstore was going out of business. I was a graduate student at Columbia University’s urban planning program, immersed in learning about all thing s New York. Of course, the bookstore’s sale was a must-visit event. The bookstore was full of fascinating items, but most were either too expensive or too arcane for my interests. But one item fell right in the middle: not too pricey (the $100 was worth it, given the contents) and absolutely captivating, especially for someone like me who was also immersed in learning about computer mapping at the time. The document was a New York City Market Analysis, published in 1943. Inside the cover the bookstore staff had written “Scarce Book”. I leafed through it and was amazed at the color-coded maps of every neighborhood in the city, visualizing down to the block what each area was paying in rent at the time. Each of 116 neighborhood profiles also included statistics from the 1940 Census, a narrative highlighting key socio-economic trends at the local level, and a handful of black & white photos. I knew the document would come in handy one day. But once I bought it, it pretty much just sat idle on my shelf. That is, until earlier this year when news of the 1940 Census data coming online started to pick up steam. Lightbulb! If we could republish the 1943 Market Analysis, it would provide context for the individual 1940 data, and the 1940 Census would be a great hook to focus attention on this incredible historic resource documenting city life from that era. The 1943 document was copyrighted. But copyright law as subsequently amended required copyright owners to explicitly renew the copyright within 28 years or forego rights to the material. In this case, the 28 year period ran to 1971. With the help of CUNY’s legal team and others, we determined that the copyright was not renewed. The 1943 document is in the public domain. Our team at the CUNY Graduate Center decided that an easy but effective way to republish the material would be with a simple interactive map: click on a neighborhood to display its 1943 profile. The project became more involved than that — and our effort is still very much a work in progress — but that basic feature is what’s available at our Welcome to 1940s New York website. Each neighborhood’s population size is compared with another U.S. city (e.g., with a population of almost 180,000 in 1940, Williamsburg, Brooklyn was “larger than Fort Worth, Tex.”) The comparisons reflect a time when the city’s population — overall, and even for specific neighborhoods — dwarfed most other urban areas across the country. Color-coded Maps: rent too damn high even in 1940?! The maps portray the geographic patterns of monthly rent levels across the city, ranging from under $30 to $150 per month or more. After adjusting for inflation, the high-end rent would be just under $2,500 in today’s dollars – in some contemporary neighborhoods, still a relatively modest rent. With the maps, you can see for yourself how closely or not the patterns match life in our city today. As you do, take a moment to appreciate the cartographic craftsmanship involved in color coding each block based on Census data. No desktop computers or Google Maps back then! Each profile includes black & white photos from the early 1940s, usually of typical residential or commercial blocks in the neighborhood. The photos are angled in the original, so don’t worry that the scanning process tilted the images. Maspeth is not a thickly settled district, but it enjoyed a 10 percent population growth in the 1930-1940 decade. The southwestern portion is an industrial area. Much of the southeastern portion is devoted to cemeteries. The residential area consists almost entirely of one and two-family dwellings. Most of the houses adjoining the industrial area are old and in the low rental group. There are some newer homes in the northern section of the district. The balance of the homes are of the less pretentious type. Grand Avenue is the main shopping street. The Welcome to 1940s New York website is the result of David Burgoon’s professionalism, creativity, and efficient, effective development. Kristen Grady georeferenced maps from the 1943 document in order to create a GIS layer of neighborhood areas which you see on the website, as well as the citywide map of rent levels. The website’s logo was designed by Jeannine Kerr. The website relies on jQuery, the basemap is from MapBox, map navigation is provided through Leaflet.js, and the neighborhood map layer is hosted by cartoDB. We are indebted to DocumentCloud for hosting the individual scanned pages from the 1943 document, and for providing online access to the material, including high-resolution versions of the Market Analysis profiles. Several people reviewed early versions of Welcome to 1940s New York and provided helpful critiques and recommendations for improvement. Hopefully we did justice to their suggestions. They include: Jordan Anderson, Neil Freeman, Kristen Grady, Amanda Hickman, Michael Keller, Nathaniel V. Kelso, Jeannine Kerr, and Dan Nguyen. The individual pages from the 1943 Market Analysis were scanned by the FedEx Office staff at the 34th St & Madison Ave location. Big thanks to them! discussing a potential exhibit (or exhibits) with local institutions such as the Museum of the City of New York, the New-York Historical Society, and/or the NY Public Library. I’ve been lucky enough to pore over the original myself, and seeing it (and experiencing it in a tactile way) is inspiring. I worry that making it accessible interactively the way we’ve done it – neighborhood by neighborhood – disembodies it perhaps too much. (Online access makes it widely available, but maybe takes something away from the experience, sigh.) But nonetheless I hope everyone can check out the website, get a sense of what New York was like more than 70 years ago, and put the material to good use. We launched a companion map featuring Congressional districts with statistics on eligible voters by race/ethnicity compared with total population. We also submitted a letter today to the court [PDF] suggesting that they can use our maps to visually compare the different proposed lines. Hopefully they’ll put our online maps to good use as they review the different Congressional district proposals. We’ve made two updates the information below. We’ve added the Congressional district data in shapefile and KMZ formats based on Common Cause’s submission to the court. We think this will be especially helpful since the court has asked the intervenors to compare their maps with Common Cause’s proposal. Now you can visualize the proposed districts based on the mapped data below at the Center for Urban Research’s interactive redistricting site. view the proposed districts in relation to block-level demographic maps (do any of them appear to “pack,” “crack,” or dilute the potential voting power of minority populations?) or local voting patterns (click the “More Data” tab at the bottom right). Today the New York World posted an analysis of how these different Congressional district proposals might impact Rep. Charles Rangel’s current district 15. If you’re hoping to use GIS or any of the online mapping tools to map the Congressional district lines in New York State that were proposed late yesterday, you’ll have some work to do. The maps were released in PDF format as well as “block assignment lists” for the proposed districts. We hope to add these soon to our interactive redistricting map. Stay tuned! Our team at the Center for Urban Research is collaborating with The New York World to analyze the impacts of redistricting in New York State. The latest effort was featured today on the front page of the Times Union; it focuses on how the majority parties in the State Senate and Assembly would likely retain — and strengthen — their control of both houses through the redrawn district lines. Briefly, we found that the new boundaries for state Senate and Assembly districts proposed by LATFOR would increase the number of seats held by the majority parties in both chambers. 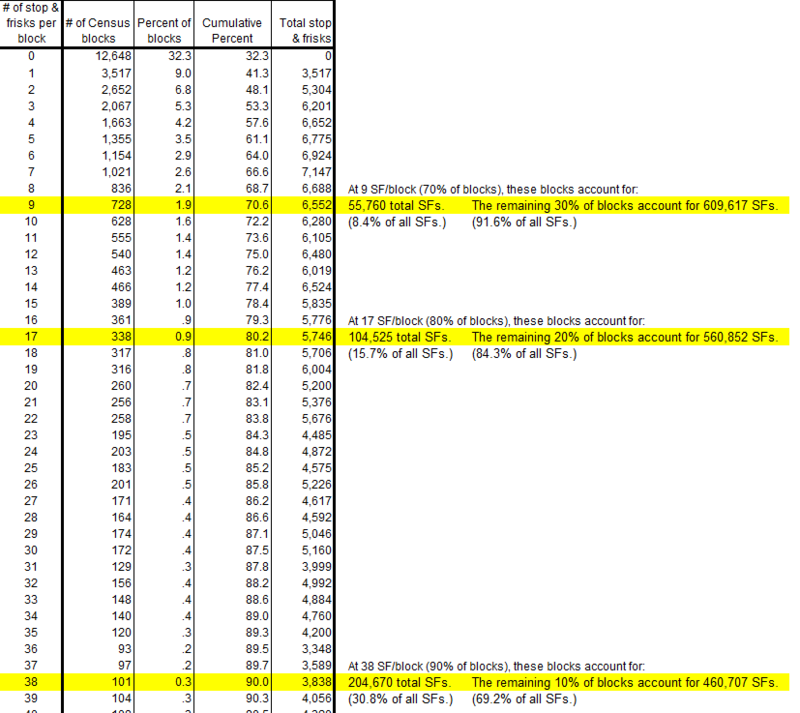 We based the analysis on 2010 election data available from LATFOR’s website. The goal was to determine the results of state legislative elections held within the new districts if voters cast their ballots in the exact same way as they did in 2010, the most recent election year for State Senate and Assembly. In the State Senate, the Republican Party’s 32-to-30 majority would expand to 34-to-29 if each voter cast his or her ballot in support of the same party as in the 2010 elections. In the State Assembly, the 98-to-50 advantage the Democrats enjoyed following 2010’s elections would also increase, to 102-to-48. The project was a good example of the power of GIS. The analysis didn’t necessarily need a map to display the results (though Michael Keller at the NY World put together a nice one). But the analysis effectively wouldn’t have been possible without GIS. We analyzed election results at the level of voter tabulation districts, or VTDs, which are several blocks in size and typically cast no more than a few hundred votes in state legislative elections. We mapped the VTDs onto the new lines proposed by LATFOR, then added up the votes of all VTDs that fell within a proposed district to determine its outcome. In order to allocate the VTD-level vote counts to LATFOR’s proposed districts, CUR matched VTDs spatially with the current and proposed legislative district using ESRI’s ArcGIS Desktop software. The current and proposed Senate and Assembly districts are coterminous with Census blocks (in fact, the districts are “built” using Census blocks). Unfortunately, neither LATFOR nor the state’s Board of Elections provides election results at the block level. The Board of Elections records data by election district, which sometimes are smaller than VTDs, but for this project we did not have access to the election district data. The challenge was that where the VTDs were larger than Census blocks in some places, the VTD boundaries crisscrossed the district lines (see example at right from Queens; click to enlarge). In order to assign Senate and Assembly district IDs to each VTD, CUR converted the VTD boundaries to centroids (the geographic center-point of each VTD). We used the lat/lon centroid values provided by the Census Bureau’s TIGER data. Then we used a spatial join using ArcGIS to add legislative district identifiers to each VTD based on the legislative district its centroid was inside. See the image below for the locations of the VTD centroids in this area of Queens. weighting the VTD vote count based on the area of the portion of the VTD in each district. Either of these approaches will result in fractions of people being assigned to one legislative district or another. In fact, LATFOR appears to have used some sort of weighting method to assign election district vote counts to VTDs, since some of LATFOR’s VTD vote totals included fractions. The centroid-approach and the weighted population / area approach both make assumptions about how to allocate vote counts. But we tested the centroid process with current legislative districts and found that our VTD-allocated vote totals either exactly matched the results from the Board of Elections or were within a few hundred votes (which did not change the 2010 outcome). Whether we used the centroid-approach and the weighted population / area technique, it otherwise would’ve been difficult if not impossible to determine how to allocate the VTD-level vote counts to legislative districts without GIS. There are almost 15,000 VTDs across New York State, and there are (currently) 62 Senate districts and 150 Assembly districts. With GIS, the process was relatively straightforward and efficient. At the VTD-level, LATFOR provides the total number of votes cast by party in each election, not by candidate. One challenge that we confronted was assigning the votes cast for fusion candidates who were backed by a major party but also received support on smaller parties’ ballot lines. For example, many Democratic candidates received significant numbers of votes on the Working Families Party ballot line, and many Republicans got substantial support on the Conservative Party line. Cross-party endorsements were even more variable for the Independence Party: in some districts, the Democrat received support on the Independence Party line; in others, its endorsement went to the Republican. We decided that the most accurate way to re-map the election results was to assign the votes for each VTD based on the actual vote patterns for the Senate or Assembly district that contained that VTD in 2010. In other words, if the Democratic candidate in an Assembly district ran on the Democratic, Conservative, and Independence lines, we assigned the Democratic, Conservative, and Independence votes in all the VTDs in that district to the Democratic candidate. When we allocated the VTDs to the proposed Senate and Assembly districts, we added up the votes based on these patterns. This ensured that the local voting patterns from 2010 were allocated accurately to the proposed districts. The result is that we were able to calculate the number of proposed districts that, all other things being equal, would have had a Democratic winner in the Assembly and a Republican winner in the State Senate. The important finding is that both parties would have increased their majority — which is especially interesting in the Senate, where the Republicans currently only have a 1-seat majority. In Albany, the majority in each house is extremely powerful, so holding on to (or improving) those margins is all-important. To be sure, no district votes the exactly the same way in consecutive elections: the quality of candidates, changes in the population and the national political climate (which in 2010 favored Republicans) all play important roles. But voting behavior in previous elections offers the best available indication as to how a district is likely to perform. The map that the New York World published along with the article uses red/blue color-shading to visualize the impact of the voting patterns on the proposed districts. In the state Senate, the analysis shows the majority party increasing the number of seats by two. On the map, that result is almost lost in the sea of red districts (most of the Republican seats are in upstate New York and Long Island, where the districts cover much larger areas than the more densely populated and largely Democratic districts in New York City). The real power of our finding is the change in number: from 32 to 34. In some ways, that says it all. Nonetheless, the map (along with CUR’s interactive map comparing current and proposed district boundaries) provides a strong graphic and interactive element to the story, and provides context as you move your mouse over the districts to see the vote totals change from one to the next. Watch for more analysis as LATFOR publishes its proposed Congressional district lines, and when the final Senate and Assembly districts are drawn.